State winner will be eligible to perform at Lecturers’ Conference and at National Session. 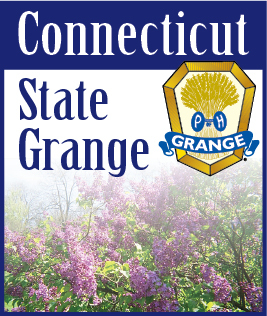 STATE RUN-OFFS will be held at Cheshire Grange Hall, 44 Wallingford Rd., Cheshire, CT 06410, in conjunction with Let's Celebrate Day / Grange Sunday. 1. All performers being judged must be Grange members. Groups performing may include Junior Grangers and/or children too young to hold Junior Grange membership. However, at least half of the performers in the group MUST be Subordinate members. 2. Participants need not be members of the same Grange. 3. Taped accompaniment for vocal acts must be instrumental only with no additional voices in the background. When the accompanist is only the accompanist and not a performer in his/her own right, it is no longer required that the accompanist be a Grange member. 5. No sign language performances will be permitted in this contest. 6. Time Limit: There is no minimum time. Maximum time is six (6) minutes. Two (2) points per minute, or portion thereof, will be deducted from the total points for all performances going over the maximum time limit. 7. The Best of Show entry from each State Grange will be eligible to perform at Lecturers’ Conference and at National Session.. The State Best of Show is to be the overall outstanding act selected by the judges.